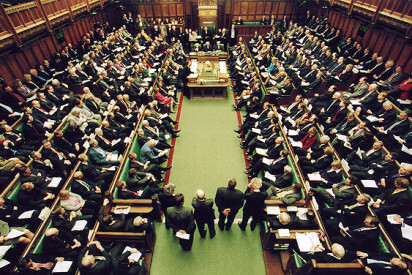 In support of the formation of the all-party parliamentary group for West Papua, the anniversary of the founding of IPWP and a speech at the UN in support of West Papua by the Prime Minister of the Republic of Vanuatu, this Wednesday, 16th October, mass protests were carried out throughout West Papua and Indonesia. 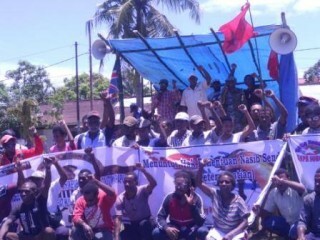 Demonstrations were held in Jayapura, Timika, Fakfak, Merauke, Biak, Yahukimo, Yalimo, Wamena, Nabire, Sorong, Boven Digoel, Kaimana, Manado and North Sulawsei and were orchestrated by the West Papua National Committee (KNPB) and Alliance of Papuan Students (AMP). There were reports of up to 11 incidents of police firing shots at protesters and forcibly dispersing almost all demonstrations. 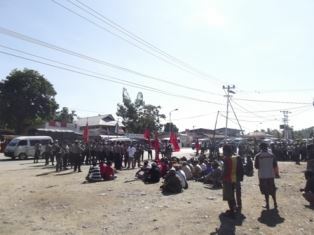 Hundreds of pictures of the day were sent to us from West Papua, including several which show West Papuans sitting peacefully and unarmed on the ground whilst hundreds of fully armed Indonesian police surround them with armoured vehicles including water cannons sold to them by the British government. “We just saw in West Papua only silencing, blockades and arrests against the people of West Papua” said KNPB spokesman, Wim Rocky Medlama. 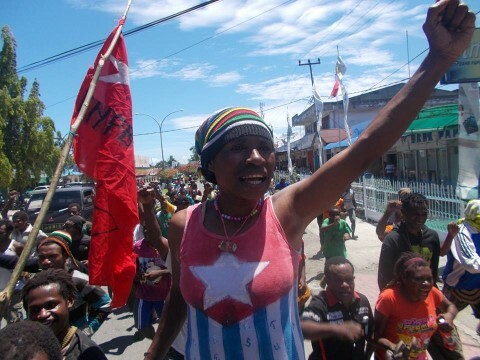 It is with such statements as these that the International Community leans of how the people of West Papua will continue to resist the Indonesian forces until their nation is free once again.